Also known as cilantro, this herb is abundant in all grocery stores. It is very fragrant and is used as a garnish, in chutneys and in sauces. The tender upper stems of the plant are also very flavorful and should not be discarded. Throw away only the root and fibrous parts. To store fresh coriander, slice off and discard the roots, wrap the coriander lightly in paper towels and put in a plastic bag. Refrigerate for up to a week. 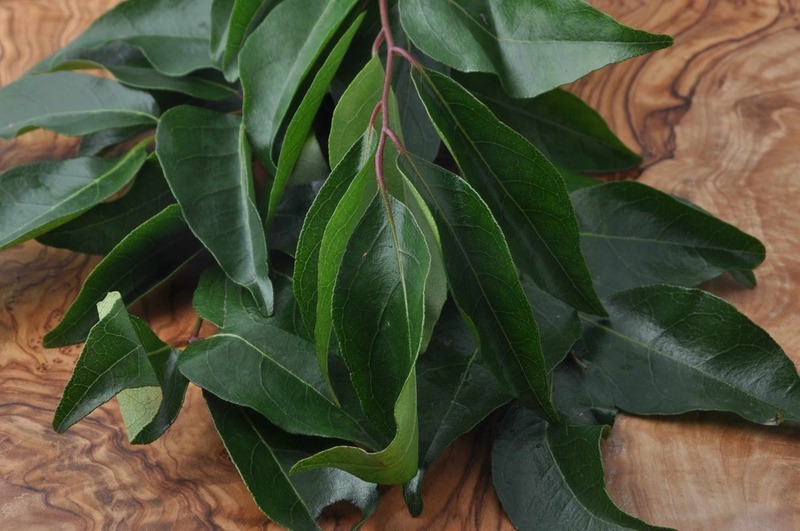 When fresh, curry leaves are extremely fragrant and used in most south Indian cooking. Curry leaves are thrown into hot oil with mustard seeds and add a distinctive flavor to the food. They are also ground into chutneys and are used in marinades for grilled food. Fresh curry leaves are found in Indian grocery stores and can be refrigerated in plastic bags for 2 weeks. Use dried curry leaves only if you are unable to get any fresh ones, as they lose most of their flavor when dried. Fresh mint is sold in all grocery stores and farmer's markets. It is used in making chutneys and in flavoring drinks and raitas. Fresh mint can be wrapped in paper towels and stored in plastic bags in the refrigerator for 2 weeks. Although dried mint leaves are to be found in Indian grocery stores, they are not as aromatic as those made at home. Using a microwave oven, it is easy to dry mint at home. Wash the leaves and dry them with paper towels. Put them in a plate lined with paper towels and microwave them on high for 1 minute. Stir the mint around to turn the leaves and microwave again for a minute. Now leave the plate on your kitchen counter overnight. The leaves should be dry and brittle the next morning. Instead of microwaving them, you can also leave them to dry in a plate on your kitchen counter for a day or two. You can store them indefinitely in an airtight container. Just crumble the leaves with your fingers and blend them into the dish as required. Usually long thin green chilies are used in Indian cooking, but you can substitute jalapeño peppers or any other kind of your choice. If you find them too hot, you can deseed them or use only half.